Waddon Leisure Centre, one of Croydon’s Tory council’s prestige projects, has had to close its main pool “until further notice” – because it’s getting a supply of extra water coming in from outside. The leisure centre management made the decision this morning because a window around the 25-metre pool had been blown in during the recent storms. The safety of the rest of the windows must also be a concern. 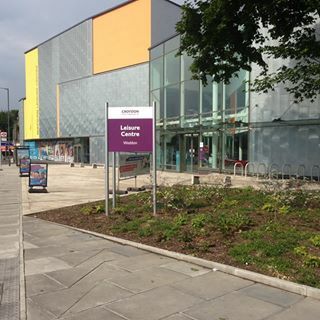 It is less than 12 months since Waddon Leisure Centre finally opened after six years in the planning and build. The centre cost £15 million under Croydon Council’s controversial CCURV property speculation scheme, though clearly not enough was spent on fitting windows that can withstand British weather. “We’ve had to close the pool urgently for a few days,” one of the leisure centre’s staff told Inside Croydon this lunchtime. With the closure coming right in the middle of the school Christmas holidays, and with adults’ New Year get-fit resolutions ready and waiting to be activated after over-indulging over the holiday period, the closure is likely to be expensive as well as embarrassing. Waddon charges local residents £44 per month to use its various facilities – including the pool – nearly a tenner more than some of the offers at nearby commercial sports and health centres. “We’ve got people in looking at the problem right now,” the leisure centre staff said. Asked when the pool might re-open, there was uncertainty. “We don’t know. It could be a few days. Purley Pool, which the council wants to close, remains functioning and open. This entry was posted in Health, Sport, URV, Waddon and tagged Christmas, Croydon, Croydon Council, Leisure centre, London, London Borough of Croydon, New Year, Upper Norwood Library. Bookmark the permalink. I suspected the poor quality of build of this facility. It is quite disgraceful how this local authority has relinquished valuable assets and left residents with low quality assets, which will require renewal in a short period of time. Wonder who benefits from this??? I was one of the first to use the centre when it opened last January. I was impressed with the facilities. I went back on a number of occasions in the ensuing few weeks, but I was less impressed by the steady decline in service. In particular, someone’s bright idea to turn the pool heating down left the water too cool for comfort. I was told the council needed to save money. Talk about spoiling the ship. Judging by the e-mails I have received since, the centre is already struggling for members – this closure will simply make matters worse. A commercial operator would raise the water temperature and lower admission charges to entice swimmers to come along – but this is the council, with an endless supply of public money to waste. Will the new and ugly glass HQ withstand high winds once Taberner House is demolished? Indeed, might it shatter when the demolition takes place? All the new buildings in Croydon do not seem to have been built to last more than a few years. 1. Ring up a glazing firm and get them to board it up until a replacement can be installed. The single window being blown out was one thing. The broader structural issues it raises about the safety of all the other glass windows in the new building is another issue altogether, and not one that could be resolved readily this side of the new year. So this is not an issue with the on-site management, but with the overall build quality of a CCURV project. Davecallum do you know the water temperature now and before? There are well established temperatures for pools set by the dept of health or whatever they are called these days. Pools where exercise swimming is the main objective tend to run cooler as people still sweat when working out, this also requires a higher cleaning / chemical requirement. Getting these wrong can lead to toxic gas release in the pool.